The share of Catholics in Latin America and among U.S. Hispanics is declining, according to two major Pew Research surveys, including a new poll on religion in 18 Latin American countries and Puerto Rico. But the two surveys also show that while Latin Americans leaving the Catholic Church largely have migrated to evangelical or Protestant churches, many of their Hispanic counterparts in the U.S. are abandoning religion altogether. Of the nearly one-in-four U.S. Hispanics who have left Catholicism, about half (49%) now say that they are atheist, agnostic or have no particular religion, including 55% of those born in the U.S. and 44% of those born outside the U.S. Roughly four-in-ten (41%) Hispanics who have left the Catholic Church say they have joined Protestant churches. By contrast, most ex-Catholics in Latin America have joined Protestant churches and relatively few have become religiously unaffiliated. In a majority of countries polled, roughly two-thirds of former Catholics or more have become Protestants. Many are specifically identifying as Pentecostal or joining Pentecostal denominations. In most Latin American countries surveyed, significantly fewer former Catholics have left organized religion altogether. The share of the unaffiliated among former Catholics is less than a third in most of these countries. The exceptions are Mexico and the “Southern Cone” countries of Argentina, Chile and Uruguay. In these countries, four-in-ten or more former Catholics have become religiously unaffiliated. Roughly half of Hispanic adults in the U.S. are first-generation immigrants — that is, they were born in Latin America and moved to the U.S. Culturally, U.S. Hispanics are similar in many ways to their counterparts in Latin America. But when it comes to religious switching, U.S. Hispanics are less like Latin Americans and more like the general population in the U.S. For instance, in the United States, 20% of the general population and 18% of all Hispanics claim no religious affiliation. 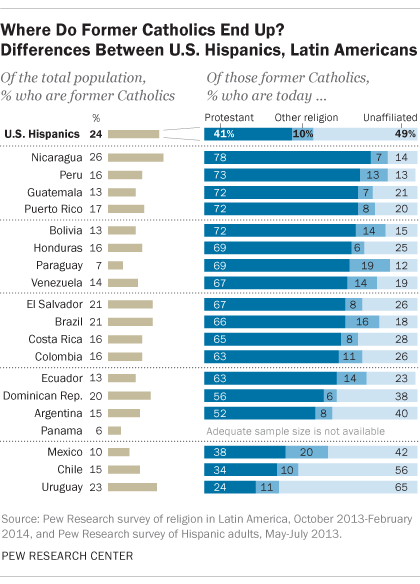 By contrast, in most Latin American countries, fewer adults are religiously unaffiliated. For example, in Mexico, Nicaragua, Panama and Venezuela, 7% of people say they are atheist, agnostic or nothing in particular. In addition, Hispanics in the U.S. are less religiously committed than Latin Americans. In the U.S., 56% of the general public and 60% of Hispanics say religion is very important to them. By comparison, two-thirds or more in most Latin American countries, including in Honduras (90%), Ecuador (76%) and Brazil (72%), say religion is very important in their lives. Fatima Ghani is a Research Assistant at the Pew Research Center’s Religion & Public Life Project.